The Official Ornament of the United States Senate features a view of the east front of the Capitol superimposed over a translucent blue window. The window with its elegant tracery is a representation of the fan-shaped transoms found over the doors in the Senate Reception Room. 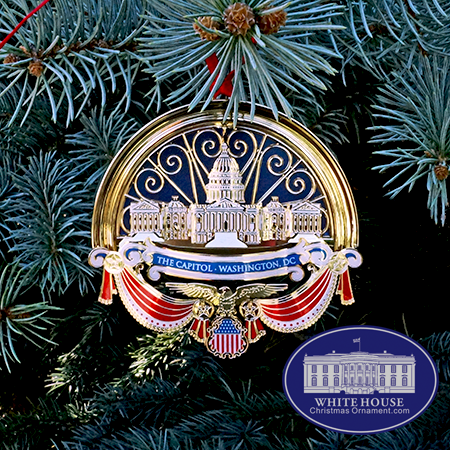 The bottom of the ornament is composed of bunting in red and white enamel, accented with small red stars. The drapery supports a gold American eagle standing atop a red, white, and blue shield, signifying strength and unity. The ornament is created layered 24 karat gold finish cutwork and multicolored enamel detailing.